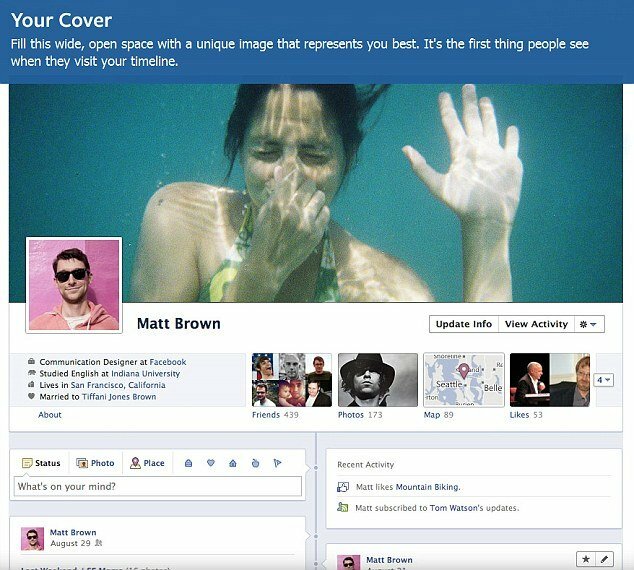 Facebook’s Timeline, which exposes people’s entire history on the site, will become mandatory for all users. Timeline has been voluntary up until now. From now, users will simply be notified that they are being “updated” via an announcement at the top of their home page, which users click on to activate Timeline. As with voluntary switches to Timeline, those who are “updated” will have just seven days to select which photos, posts and life events they want to advertise to the world. Via its official blog, Facebook announced: “Last year we introduced timeline, a new kind of profile that lets you highlight the photos, posts and life events that help you tell your story. “Over the next few weeks, everyone will get timeline. When you get timeline, you’ll have 7 days to preview what’s there now. Timeline has been criticized for showing off pictures and posts that people might have wanted to forget. The new look also pairs with “timeline apps”, such as Spotify, which post every time people listen to a song, or eat a recipe or visit somewhere. “You can learn more about these new features by taking the quick tour available at the top of your timeline,” says Facebook. Mark Zuckerberg described timeline as letting you “tell the whole story of your life on a single page”. The redesigned pages have a more magazine-like photo-heavy feel, with a large “cover photo” at the top of the page. On the right of the page there will be a timeline that breaks down all posts from a person’s time on Facebook and allows viewers to jump back to people’s earliest posts with a break down month-by-month. Some were puzzled by the abrupt roll-out of the change, which is one of the biggest changes to Facebook – all the more so when paired with the new Timeline apps, such as Spotify, which posts a continuous stream of all songs listened to your Timeline. A user listening to Spotify on a smartphone, for instance, will default to posting every song to their Timeline for all to see. As with all Timeline features, there are various opt-outs, but they can be fiddly to find and use. Likewise, e-book readers such as Kobo and video services such as Netflix can post every book and film people consume to Timeline. Many sites published guides to how to “hide” controversial content. Twitter users had mixed reactions. Many were shocked by how rapidly timeline had become compulsory. So far, Facebook has announced a few dozen Timeline apps. Many sites recommend vetting apps carefully to see what they will post, and creating lists of friends to “share” certain updates with, rather than bombarding your whole friends list. Facebook says that more Timeline apps, covering more interests will launch soon. “Our vision for Timeline and our vision for the application platform is whatever you love and whatever story you want to tell, you can add that to your Timeline,” said Carl Sjogreen, Facebook’s product management director. Facebook Timeline with Apps and Ticker. “Our message to developers is <<start your engines>>,” said Carl Sjogreen.